rec. no date given, PPI Recording Studios, Soho. New York. 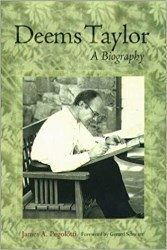 The name of the American composer Deems Taylor is better known for his looming cameo appearance as the announcer at the start of the 1940 film Fantasia. It seems that Taylor suggested Stravinsky’s Rite of Spring for the film's dinosaur sequence. We glean, from Gerard Schwarz's foreword to the Pegolotti book, that he was a commentator for CBS radio, the president of ASCAP, a commentator on radio concerts and a close friend of musicians, artists, authors and wits including Gershwin, Robert Benchley, Edna Ferber and F. Scott Fitzgerald. He was a mover and shaker in that world, as is evidenced by his appearance on the cover of Time Magazine in 1931. As for his music, his style is tonal and melodic and not at all experimental. We are told that he saw music as the “language of emotion”. When critical reception "moved on" after World War II his scores were was left high and dry. The Pegolotti biography is extensive and is likely to both satisfy curiosity to hear the music and arouse it in equal measure. 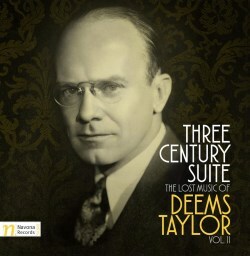 Speaking of which, there are two modern Deems Taylor recordings and each is conducted by Gerard Schwarz. Both recordings are on Naxos: Peter Ibbetson (his only opera to be recorded complete) and Through the Looking Glass. There is also a 1938 archive recording by the Columbia Broadcasting Symphony conducted by Howard Barlow on Kipepeo Publishing which was made in New York, under the supervision of the composer. YouTube allows you to hear other examples of his orchestral music in historical recordings which are catalogued in an appendix to the book. There is a useful Deems Taylor website. Pegolotti systematically lists Deems Taylor's scores and leaves us wanting to explore two cantatas from 1914 (The Highwayman - a subject also explored by Armstrong Gibbs - and The Chambered Nautilus) as well as the unpublished tone poem The Siren Song (1912), the J Fischer-published symphonic poem Jurgen (1925) and a 1943 Christmas Overture. There are also various operas including Peter Ibbetson. Opera was indeed one of his main preoccupations and apart from three lighter confections these include The King's Henchman, a lyric drama in three acts (1927), Peter Ibbetson, a lyric drama in three acts (1931); Ramuntcho, in three acts (1942) and The Dragon, opera in one act for amateur performers (1958). 2016 saw the 50th anniversary of Deems Taylor’s death. Navona took the opportunity to make available a download of his Three Century Suite. This was performed, in Interlochen, Michigan, in 1961, conducted by that luminary of the North American windband, A. Clyde Roller. The Three Century Suite should, according to Pegolotti, be known as the Three Centuries Suite. It began life as the Restoration Suite, which accounts for the flavour of the movement titles: Pavan, Saraband, Jig, Rigadoon and Bartholomew Fair. The music is old-fashioned, lyrical and traditional. It was written in the late 1940s and was completed in its current form in 1950. 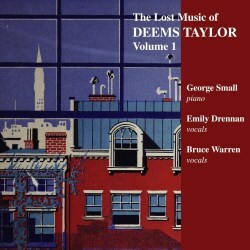 The songs to be heard in Deems Taylor's The Lost Music - vol. 1 are witty and at times even funny. An Eating Song includes lines such as "Won’t you try a slice of mutton", "Thankful that our teeth are sound" and "While we watch out waistlines thicken". It's a match for all those English drinking songs, including those by Warlock and Stanford. It has a ringing heroic close. The solo piano pieces featured include two from 1918. The Prelude is urgent but does not race. Yet it has about it a romantic grandeur and no jazziness. The Poem is a steady piece, rising to exultant heights with a touch of the flowery MacDowell about it. The Smugglers is a character work that is suitable for beginners. Back to the songs: The Rivals is put across with Emily Drennan's sweet and pert voice. It's a clever and slightly jazzy show song. A song for the lovers is almost in the Cyril Scott category and is more of an art-song than The Rivals. With its constant piano chime, it is very effective. The two vocalists project the words with admirable clarity. Plantation Love Song is lightly sung. One can almost see the striped blazer. City of Joy is a Poulencian cycle: sweet, slender and clever little songs sung, as to the manner born, by Bruce Warren. There are liner-notes but these do not present the sung words. Since the singers, Emily Drennan and Bruce Warren, are, as I have said, clear and pleasantly recorded this is a small loss. The CD is rounded out with Through the Looking Glass¸ as arranged for two pianos. On back of the liner sheet is the text of a letter written by Rachmaninov in fulsome praise of Through the Looking Glass. The letter is dated 1924. Through the Looking Glass, which may be more familiar in its orchestral form, is based on Lewis Carroll. We are reminded that it has been performed by the New York Philharmonic under Willem Mengelberg and the Philadelphia Orchestra conducted by Leopold Stokowski. It is well worth delving among these discs and sources. Further exploration of the choral and orchestral works known only as names and reputations is likely to reward the resource and effort.